In a comment on my prevalence day post it was suggested that I could publish exactly what the cut off levels were for each area in each country. These are simply 5% of the maximum prevalence in each area. Always happy to oblige - and the table is below for 2005/6. Also interesting is the number of practices that fell beneath the threshold in each area. What is particularly interesting in that the seems almost exclusively English problem. Being so much larger than the other countries an 'outlier' practice is more likely. In the smallest country - Northern Ireland - there are virtually no practices below the threshold at all. The number in the table are the proportion of practices below the threshold who will be rounded up. I have been doing a little bit of work around the site over the last couple of weeks and the changes are now ready to be formally announced. The first is this blog, which allows more frequent updates than the email alerts. The email alerts will continue as before as an infrequent alert to a data update. There is also a new custom Google search function available on the search page. This will search QOF related sites specifically. Any suggestions of additional sites would be appreciated. There is some improvement to the data on the site for 2005/6 - partly in the Scottish data which now includes there September update and some corrections of obvious errors in the Welsh data. And finally over on DH Consultation Feed site there has been a complete rewrite of the plumbing to make it more reliable. This site offers takes the DH consultation page and repackages it as an RSS feed. A limited audience perhaps but useful to some! 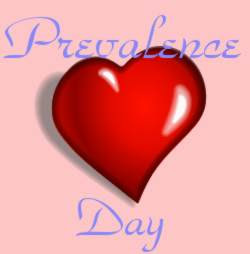 Those of us whose day has not be entirely filled with the opening of cards it is also national prevalence day. Although the computers will not do the actual calculation for another month today is the day that is taken as a baseline for all of the prevalence calculations. My thoughts drift back a year to a nursing home in London. Before I explain why I think this way I should probably explain the significance of prevalence. When the contract was first presented the value of points to a practice depended solely on the number of patients (or at least notional Carr-Hill patients). There was some fuss at time, not least pointing out that this was a disincentive to diagnose as the targets would be harder for the same amount of money. Thus an adjustment was put in. It could not be make the value of a point directly proportional to the prevalence as this would basically be a return to item of service payments. In the end the value of the point was proportional to the square root of the prevalence. There was one other factor which was largely ignored at the time. It was that any practice with a prevalence below 5% of the prevalence of the maximum was adjusted to have exactly that 5% prevalence. Those who want more detail can read the full guide. Unfortunately, and I must emphasise again through no fault of the practice, this made chaos of the prevalence formula. 5% of 35.4 is 1.77 and 97% of practices had a prevalence of less 1.77%. The upshot was that the vast majority of practices were standardised to the same prevalence and all differentiation was lost. This could amount to several thousands of pounds in difference. Practices with low prevalence gained, most practices with high prevalence lost and the square root ensured that even Nightingale House got paid less per patient than anyone. Mental health was the most prominent example but there is a similar, if smaller effect in stroke, thyroid disease and LVD. The rules are different for mental health this year as well so we shall see if the QOF payment of every GP in England still depend on a nursing home in London. As you might gather from my map section I quite like health geographics and find it a good way to view information. Of course the google maps approach is all very well but it is basically a lot of tables laid out over a map. What is much better is to the see the outlines of PCT areas. You can see neighbouring areas and it is much easier to see patterns. 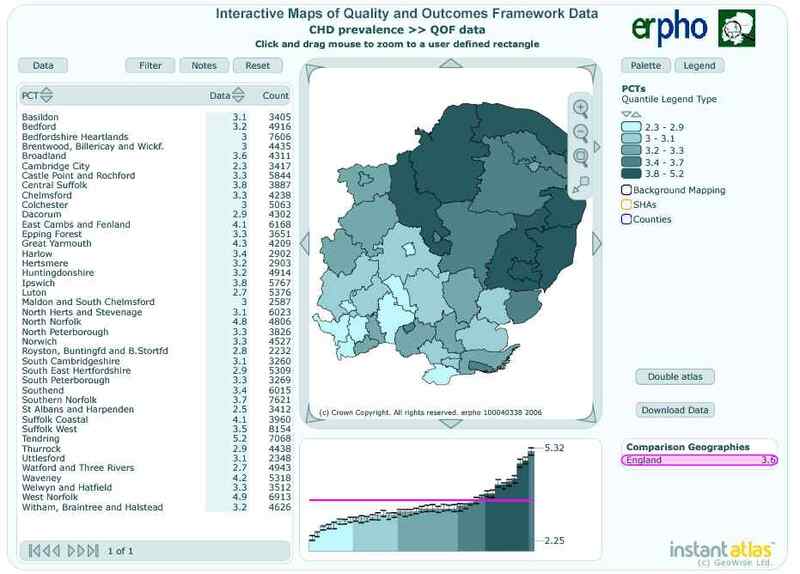 I was quite interested to see a range of interactive maps produced by the regional public health observatories. There is a still pituture above of one of them and even on the small version you can see trends quite clearly. You can find the original here (as a techical aside you will need an SVG viewer such as the Adobe one. The SVG viewer in Firefox does not appear to work for various reasons with this site). Now this is clearly the best way to do this. You could argue with the choice of SVG to present the maps but it is a very capable and open technology that has yet to find its feet. So why do we only see the 2005 data on these maps? We it appears it all comes down to money. Ordinance Survey wants lots of it to provide the data on PCT boundaries. The economics suggests that the department of health should receive money from the Treasury, pay it to the Ordinance survey who will then send it back to the Treasury. 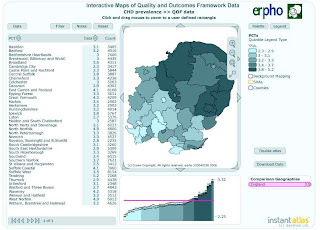 Ironically the data on PCT boundaries comes from the Department of Health in the first place, although there is a degree of processing at the OS end. There can be few better examples of how really quite reasonable projects are held back by the instance of the government on selling information to everyone, including itself. There is data sitting in one government department that would benefit the work in another, but it can't be used. Even the OFT believes that freeing information would make economic sense although there are some attempts to justify the policy also. I have had several offers to geocode the data on this site's map to allow practice level data. To be honest I have been afraid to take them up. If you want to know the grid reference of practices in the UK the Post Office wants your cash.